Exaggerator beats, Nyquist to win on a wet track at Preakness. 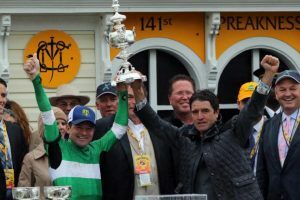 Over a sloppy track that he knows as well as any racing surface in the country, Hall of Fame jockey Kent Desormeaux gave Exaggerator a flawless ride to win his third Preakness Stakes, upsetting Kentucky Derby presented by Yum! Brands winner Nyquist by 3 1/2 lengths. Saving ground along the rail through most of the race, Desormeaux kept Exaggerator several lengths off the pace while Nyquist went to the lead, setting quick fractions over a testing surface. The previously undefeated Nyquist never showed the brilliance he displayed in previous races, faltering in the stretch to finish third. Desormeaux rode Exaggerator for his brother, trainer Keith. It was Keith Desormeaux’s first win in the Preakness.The second betting choice in the race, Exaggerator paid $7.20 to win. Keith Desormeaux said that he expects Exaggerator to run in the Belmont Stakes on June 11 at Belmont Park. Nyquist’s trainer Doug O’Neill didn’t rule out a run in the Belmont Park, saying that he’d talk to owners Paul and Zillah Reddam and see how his horse came out of the race. Exaggerator had attracted plenty of notice in the week before the race, once a wet racetrack seemed virtually confirmed by weather forecasts, having two wins and a second-place finish about muddy and sloppy tracks, most recently in the Grade I Santa Anita Derby last month. The Infield always has a party going on and this year was no different……. Laura Stall said “I’m so excited,” she said of the lineup, though not familiar with the artists. “I don’t understand any of it. I just think it’s so exciting. The energy, the people … I forget there are horses. I’m having a blast.” The highlights of this year’s InfieldFest were hip-hop artist Fetty Wap and DJ duo The Chainsmokers. They’re newer acts in comparison to some of the long-established artists who have performed at Preaknesses past (Maroon 5, ZZ Top). But they were in line with a strategy that has increasingly focused on electronic dance music and hip-hop acts with youth appeal (last year’s draws were EDM performer Armin van Buuren and comedian Donald Glover’s hip-hop persona, Childish Gambino). They succeeded in uniting young and old, turning the infield into a dance floor.